Kamal Public Sr. Sec. 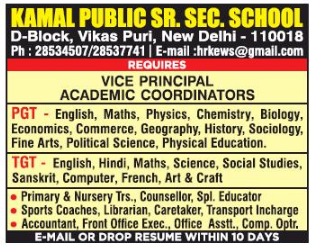 School, New Delhi has advertised in THE HINDUSTAN TIMES newspaper for recruitment of Teachers PGT / TGT / PRT / NTT jobs vacancies. Interested and eligible job aspirants are requested to apply within 10 days from 15th January 2019. Check out further more details below. About School: Kamal Public Sr. Sec. School is run by Kamal Educational & Welfare Society in Vikas Puri, New Delhi. It is co-educational school and provides education from Pre-School to Class XII. It is affiliated to CBSE and is recognised by Directorate of Education. How to Apply: Interested and eligible candidates are requested to send application along with CV, copies of certificates, testimonials and recent Passport Size photograph to the postal address or email address mentioned below.